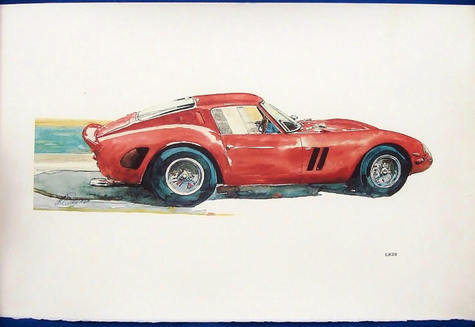 Selling a print of a watercolor painting by Charles "Chuck" Queener of the 4-liter Le Mans/Nürburgring GTO. Print is about 12.75"x20", on thick rag paper. (The top and bottom edges are raggedy on purpose, that's how it was produced.) This was part of the charter subscriber membership for the U.S. edition of Automobiles Classiques magazine back in 1984. Mine's #1839, but no limitation stated. Never displayed, but has a few very minor/light bend 'humps' (not wrinkled/creased) along top from rolling/unrolling, but you don't see them on the front, and they would be nearly invisible when framed. These aren't on the market often, so if you're a Ferrari, Chuck Queener or exotic car art fan, or know someone who is, buy this now while you have the chance. Only $20. I'm not online until mid-afternoon eastern time, and evenings on and off. I reply as soon as I can, so PLEASE check your email later in the day or evening, and please reply back in a timely fashion, thanks. Sorry, but I DO NOT TAKE PAYPAL. I charge exact shipping, no handling or other padding fees! Please send at least your zip code, or your whole address if you're sure you're buying, on your first message so I can get you the shipping costs/choices right away, thanks. Experienced seller, satisfaction guaranteed on condition or money back.